This article is about the town. For the census-designated place, see Pepperell (CDP), Massachusetts. Pepperell is a town in Middlesex County, Massachusetts, United States. The population was 11,497 at the 2010 census. It includes the village of East Pepperell. Pepperell was first settled in 1720 as a part of Groton, and was officially incorporated as its own town in 1775. The founders named it after Sir William Pepperrell, a Massachusetts colonial soldier who led the Siege of Louisbourg during King George's War. The town was noted for its good soil and orchards. Since its formation, the town was active in the American independence movement. Being located northwest of Concord, Pepperell never saw British attack during the American Revolutionary War, though several Pepperell men fought at the Old North Bridge during the Battle of Concord, and a British spy was captured by women on guard at the site of the Pepperell covered bridge (see Prudence Wright[better source needed]). Town resident William Prescott served as the commander at the Battle of Bunker Hill in what is now the Charlestown neighborhood of Boston. By 1837, when the population was 1,586, Pepperell had three paper mills, one of which was managed by Warren F. Daniell. It also produced palm leaf hats, boots and shoes. In 1848, the Worcester & Nashua Railroad built a line and train station in Pepperell along the Nashua River. In 1886 the line became part of the Boston & Maine Railroad, and continued to operate trains to Worcester and Nashua, as well as connections to Portland, Maine and beyond. In the midst of the Great Depression, the Pepperell stop was taken out of service in 1934, and the station was subsequently demolished. Freight trains continued to pass through Pepperell until 1981, and the tracks themselves were pulled up in 1984. In 2001, what had been the train path was paved over to become part of the Nashua River Rail Trail. The town library, the Lawrence Library, was designed by architects Ernest Flagg and Walter B. Chambers, and built in 1901. On June 29, 2009 the people of Pepperell voted yes on a Proposition 2½ override, effectively saving operations of the Lawrence Library, Senior Center, and Community Center. The override helped fill a $1.3 million budget shortfall for fiscal year 2010. One of only three covered bridges on public Massachusetts roads that is open to vehicular traffic (and the only one east of the Connecticut River) is located on Groton Street in Pepperell. The current bridge officially opened on July 30, 2010, replacing the aging Chester H. Waterous Bridge which was closed to vehicles on April 7, 2008 and demolished beginning July 30, 2008. 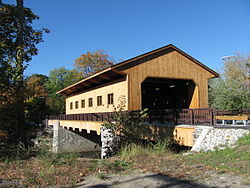 It took two years to construct the new covered bridge. According to the United States Census Bureau, the town has a total area of 23.2 square miles (60.0 km²), of which 22.6 square miles (58.4 km²) is land and 0.6 square miles (1.6 km²) (2.63%) is water. Pepperell is located at the confluence of the Nissitissit River with the Nashua River. According to the Pepperell Reader, the town is situated on a long extinct volcano that helped shape much of New England's geology. Pepperell borders Brookline and Hollis, New Hampshire to the north, Dunstable to the east, Groton to the south, and Townsend to the west. Pepperell is served by state routes 111, 113 and 119. As of the census of 2010, there were 11,497 people, 3,847 households, and 3,016 families residing in the town. The population density was 495.6 people per square mile (191.4/km²). There were 4,348 housing units at an average density of 187.4 per square mile (72.4/km²). The racial makeup of the town was 95.61% White, 0.56% Black or African American, 0.04% Native American, 1.07% Asian, 2.71% from other races. Hispanic or Latino of any race were 2.25% of the population. There were 3,847 households out of which 44.2% had children under the age of 18 living with them, 65.5% were married couples living together, 9.6% had a female householder with no husband present, and 21.6% were non-families. Of all households 17.4% were made up of individuals and 6.0% had someone living alone who was 65 years of age or older. The average household size was 2.89 and the average family size was 3.29. In the town, the population was spread out with 30.6% under the age of 18, 6.1% from 18 to 24, 33.0% from 25 to 44, 22.7% from 45 to 64, and 7.5% who were 65 years of age or older. The median age was 35 years. For every 100 females, there were 96.8 males. For every 100 females age 18 and over, there were 93.6 males. The median income for a household in the town was $82,055, and the median income for a family was $97,870. The per capita income for the town was $35,144. About 2.0% of families and 3.7% of the population were below the poverty line, including 2.8% of those under age 18 and 8.0% of those age 65 or over. Pepperell is a part of the North Middlesex Regional School District, which administers the public schools, except for the Nashoba Valley Technical High School. Public schools in Pepperell include Varnum Brook Elementary School and Nissitissit Middle School. The other two towns in the district, Townsend and Ashby, also have local elementary schools, but all three towns share the North Middlesex Regional High School. ^ "Profile of General Population and Housing Characteristics: 2010 Demographic Profile Data (DP-1): Pepperell town, Middlesex County, Massachusetts". U.S. Census Bureau, American Factfinder. Retrieved April 6, 2012. ^ "Pepperell Covered Bridge Committee"
^ "TAP Basketball". Retrieved July 18, 2017. ^ "North Middlesex Pop Warner Football". Retrieved July 18, 2017. ^ "Pepperell Youth Baseball and Softball". Retrieved July 18, 2017. ^ "Pepperell Youth Soccer League". Retrieved July 18, 2017. ^ "Boy Scout Troop 26". Retrieved July 18, 2017. ^ "Boy Scout Troop 13". Retrieved July 18, 2017. ^ "Cub Scout Pack 1455". Retrieved July 18, 2017. Pepperell, Dunstable, Shirley, Townsend, Massachusetts directory ... 1907-8. Wikimedia Commons has media related to Pepperell, Massachusetts. This page was last edited on 8 May 2018, at 00:31 (UTC).